How to Remove or Bypass PDF Security Password? PDF or portable document format is an electronic snapshot of a document that is not only navigable but can be printed with a single click of a button. PDF files contain embed type fonts that are available across different platforms. What sets it apart from other format is the security feature and that is why it can be transported to any system without the data being hacked. 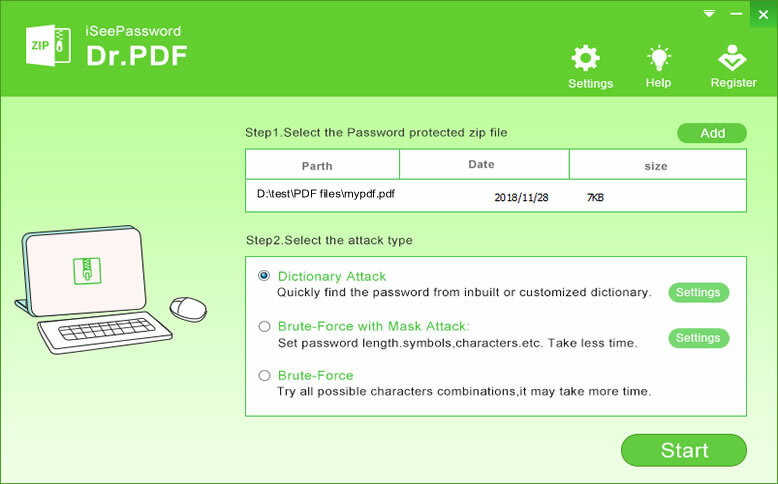 In order to create a secured file, PDF document is protected by the password. It helps to restrict the access to the content. Protecting information is essential especially if it contains business data. Storing the PDF file without a password is a free invitation to the hackers to break into the system. Generally, there are two password types associated with PDF, Owner and user password. The owner password restricts the permission to printing, copying, editing text and adding pages to the file. In order to check the restrictions, you should view the summary report wherein the printing is not allowed. The user password is also termed as an open password. Once set, an individual has to authenticate before the changing the documents. You cannot access the file in such case unless the password is known. What if I forgot PDF password? As stated above password is set up on the PDF file to save the integrity of the content however due to insufficient memory or human error, the access is rejected. In such a situation, the only option is to use a third-party application to unlock the file and that is why iSeePassword PDF Password Recovery software comes into play. It is one of the most important applications in the market that recovers not only the user level but also the owner level password a using the brute force technique. The tool is equipped with three attack type passwords capable of opening the file far quickly than with any other method available. You can use any browser like chrome or Firefox to access the website for downloading the executable file. After download, install the file on the laptop, PC. You should invoke the application and the click on the 'Open' and browse button. Select the file that you have to import into the program for the recovery of the password. One of the best attributes of the application is that it supports multilingual platform. After the selection process, click on the 'Add' button. There are three attack types to choose from in the dialog box. 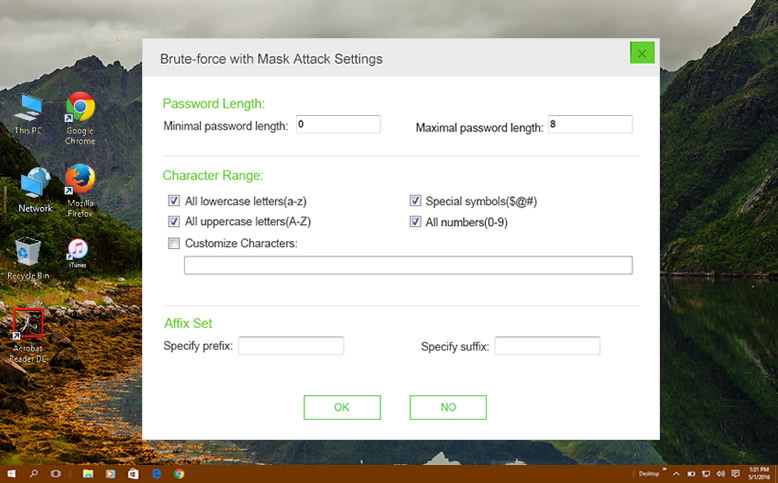 c) Brute force with a dictionary attack. All three of them operate on the basic fundamentals with varying degree of efficiency. Different possible combinations of phrase and paraphrases are deployed for correct authentications. The mask attack is useful when you know the part of the password. After settings, click on the start button. The progress bar in the dialog box indicates that the brute force algorithm has kicked in. matching occurs at a very fast pace with tracking options to check the progress. Total time depends on the length of the password. The whole process may extend to minutes however once the password is found, the occurrence is immediately notified to the users. You can copy the password by clicking the "Copy" button. The password also will be saved in the software installation. The product is a class apart when compared to the competition because it can work across diverse platforms. Gone are the days when you had to delete the file if the password was lost. With the arrival of the recovery tool, you need to go through the above mentioned steps and break the password no matter who old it is. 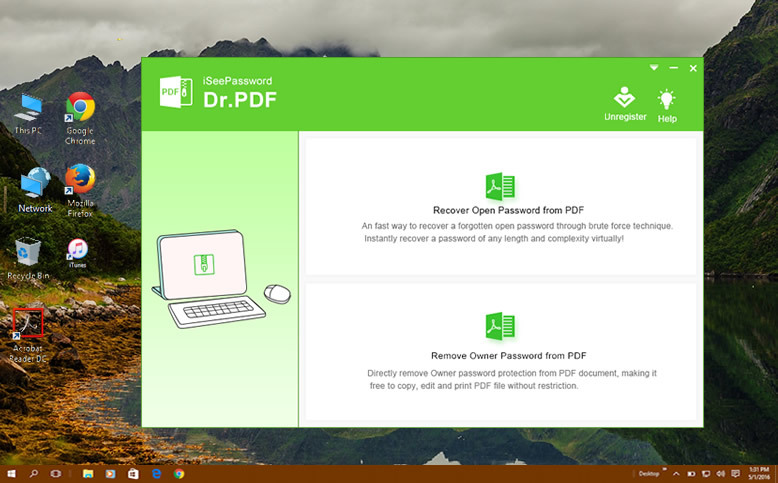 Just download the trail and try to remove or bypass PDF security password all by yourself. 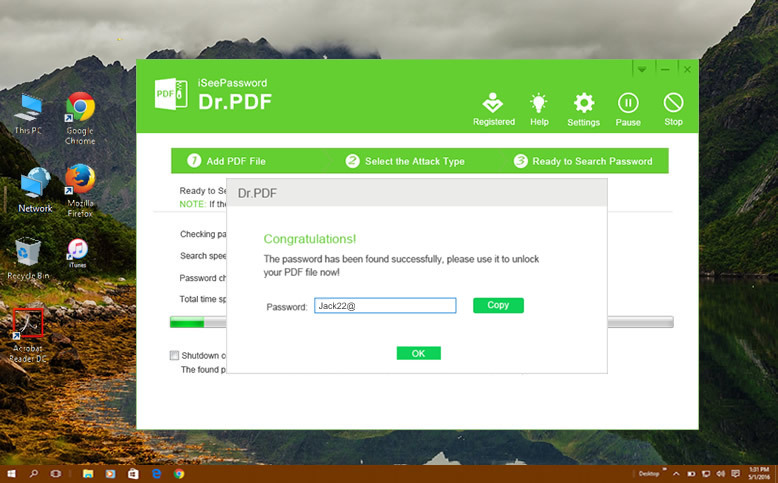 Easy, and safe, never damage to your original PDF data.